Ravel was always the most conscientious of orchestrators, who meticulously indicated exactly the internal balances he sought. In so doing he set some major problems for conductors and recording engineers in the realisation of his intentions! His early scores, such as Daphnis et Chloé or the Rapsodie espagnole, tend to balance themselves, if the performers stick closely to Ravel’s indications. When one comes to later works such as the opera L’enfant et les sortilèges matters are not always so easily resolved. The first stereo recording of the score, made by the crack Decca team in Geneva with Ernest Ansermet conducting, attracted severe criticism for the recorded balance of the orchestra which frequently reduced the singers to inaudibility. Some years later DG went to the opposite extreme for Maazel, bringing the voices forward and close to the microphone; this meant that some of the more bizarre details of Ravel’s instrumentation – the slide flute, the cheese grater, the piccolo timpani, the piano luthéal – were somewhat short-changed in a rather dry acoustic. Later recordings have generally managed a compromise between these two approaches, but it remains the case that the score is extremely tricky to balance outside the confines of the recording studio. Live performances inevitably entail the loss of some detail or other. Ravel made greater concessions to practicability in the arrangements he made for the many small vocal roles to be doubled (and even trebled) between a limited cast of singers. Nearly all the recordings of the score follow his recommendations for these; but some, including Ansermet’s pioneering stereo recording, not only make adjustments but also make out a good case for these. In particular, although the roles of the Fire and the Nightingale clearly call for the employment of the same singer, a stratospheric coloratura soprano, that of the Princess with its tricky use of duet between the voice and the solo flute can sound rather thin in the same hands. A number of the recordings fail to realise the sense of passion which emerges in these pages – which produce the first signs of emotion and regret in the naughty child. There is no such problem here with the warm-voiced Annick Massis, but she is fatally undermined by the rapid traversal her duet with the child is delivered in the hands of Stéphane Denève, reducing the Daphnis-like traceries of the woodwind to a generalised wash and the words to a gabble (track 11). This is the only serious error of pacing in the conductor’s otherwise sympathetic treatment of the score, although the unaccompanied chorus in the closing pages might also have benefited from a rather more serene pace. But many other sections blossom in his hands, notably the chorus for the wallpaper shepherds and shepherdesses (with delightfully piquant woodwind, track 10) and the slow waltz for the creatures in the garden (track 22). Time and again problems of balance are solved seemingly without effort, and the foxtrot for the cup and teapot (tracks 6-7) has all the zany sense of caricature that one could wish. Even the tricky opening, with its solo double-bass harmonics set against a pair of oboes (track 1), comes near to the ideal. 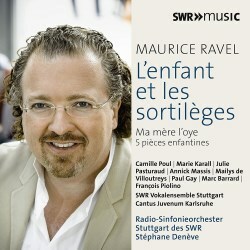 The other singers here are generally a well-characterised and accurate group, headed by Camille Poul’s boyish tones as the child. François Piolino manages well with his fiendishly difficult vocal line (his falsetto perhaps slightly weak, but clear enough) and even manages to make his cod-English as the Wedgewood teapot clear. Marie Karall is properly matronly as the mother, less so as the Chinese cup; Julie Pasuraud and Marc Barrard assume their feline guises with nonchalance; and Mailys de Villoutreys and Paul Gay in more minor roles nevertheless manage to make their mark. The choir seem to come and go in the overall balance – sometimes more forward than at others – but are always in the picture when required, although even they have difficulties making themselves heard in the turmoil of the ‘arithmetic’ scene (track 13). Ravel’s complete ballet Mother Goose was already included in an earlier volume of Denève’s series of orchestral music, so it seems an odd choice to supplement the opera here with a live performance of the suite which formed the basis of the later expanded score. Again the conductor and his players show a lively awareness of the internal balance of the instrumentation – the dialogues of Beauty and the Beast in violin harmonics and double bassoon (track 29) are characterised with humour – and although I prefer the tranquil final movement (track 30) to be rather slower, the conductor can justify his approach here by reference to Ravel’s unexpectedly quick metronome mark. The recorded sound, whether from the studio or the live performances, is excellent throughout, clear and warm. The booklet notes, in English and German only, are however far from satisfactory and definitely let the side down. Of the twelve pages in English, over half are devoted to biographies of the performers and only just over one page is given over to a very brief synopsis of the plot of the opera. No text, no translation, nor even any directions to where such essential material could be found on the internet. Ravel and Colette would not have been pleased. And is “The child and the spirits” really an accurate translation of the French title?